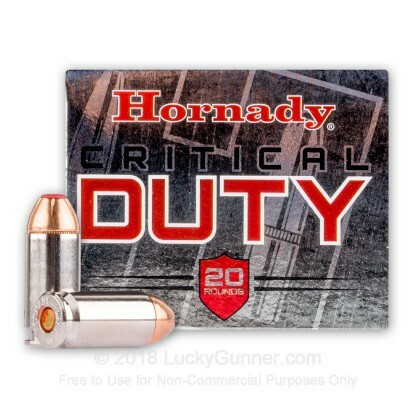 Hornady's 2012 introduction of Critical Duty ammo has been met with applause from the law enforcement community. 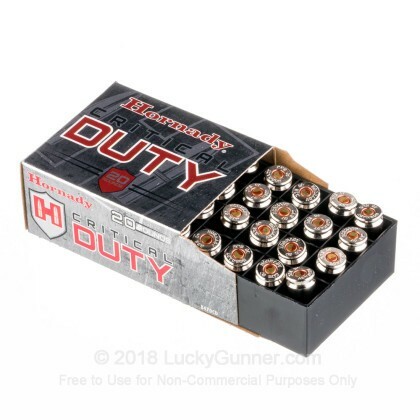 Critical Duty ammunition is designed to perform very well on the stringent FBI protocol tests making this ideally suited for law enforcement as well as personal defense situations. The biggest thing that differentiates Critical Duty from Hornady's Critical Defense ammo is that Critical Duty ammo is designed to penetrate barriers such as sheet metal, wall board, plywood, heavy clothing, and auto glass as outlined in the FBI protocols. This barrier penetration need is more prevalent in the law enforcement community due to the different types of threats that LE professionals are likely to encounter. This 40 Smith and Wesson ammo has performed very well in FBI tests maintaining great weight retention through all barriers helping it to achieve the required 12-18" of penetration into gelatin after passing through the established barriers. 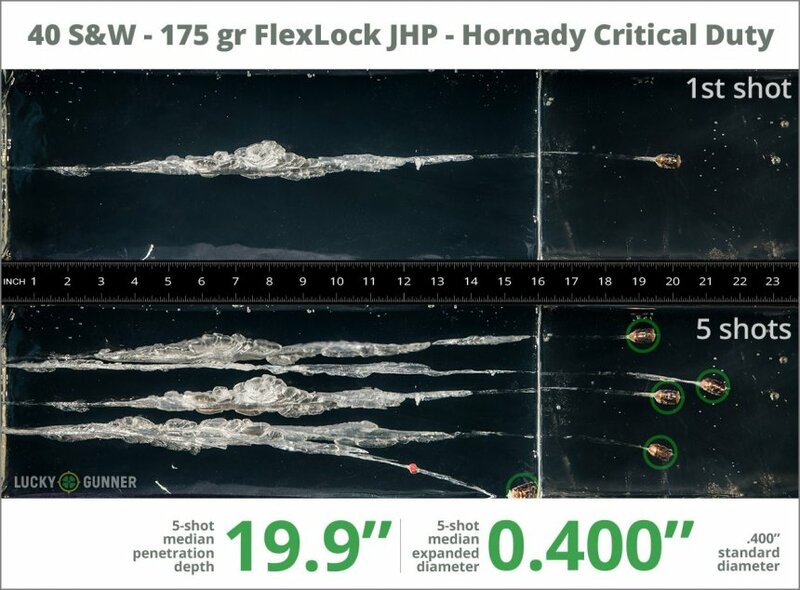 The FlexLock bullet incorporates Hornady's patented Flex Tip that initiates expansion while preventing clogging along with their Interlock band that prevents jacket/core separation. Jacket/Core separation is where most non-bonded JHP bullets fail in penetration tests because when the lead core and copper jacket separate from each other their lighter weights aren't able to achieve the needed penetration to bring down an assailant. The Interlock band prevents this occurrence. 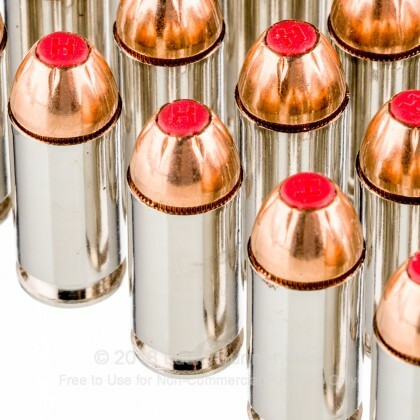 Hornady's Critical Duty line of ammo is truly a 21st century duty ammunition! After firing five rounds of Hornady 175 gr Critical Duty from a Glock 27 into synthetic ballistic gelatin from 10 feet away through four layers of fabric to simulate clothing, we then measured the expansion and penetration of the bullets for this .40 S&W (Smith & Wesson) load, which you can see in the chart below. 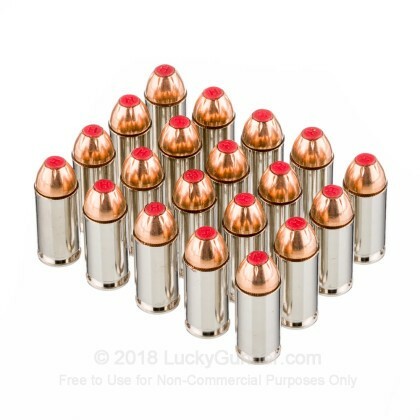 Finally, if you'd like to see how this Hornady load compares to other .40 S&W (Smith & Wesson) loads, check out the diagrams at the bottom of the page. Want to know more about our ballistic gelatin testing and self-defense ammo? Check out Lucky Gunner Labs for more information. 19.9" 0" 9.8" 16.5" 32" This ammo: 19.9" Min: 9.8" Median: 16.5" Max: 32"
Quick delivery, and great performance. 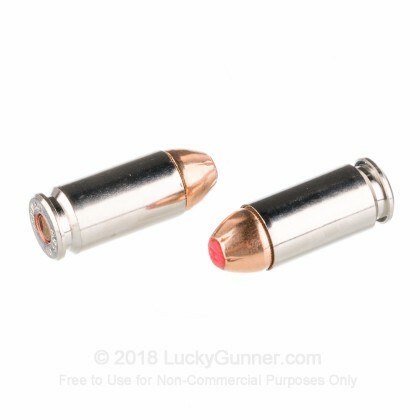 Just what I've come to expect from Lucky Gunner and Hornady. Excellent customer service combined with a quality product ensure my repeated business. The ammo was clean burning and repeatedly fired flawlessly without any problem. I would recommend this product to any 40 S&W owners. LuckyGunner had what I wanted when I needed it. Quick shipping was a plus and the price was right. 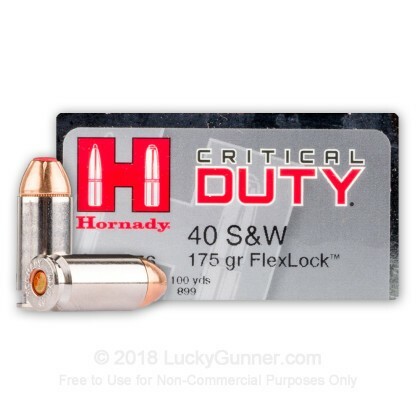 The Hornady 40 S&W Critical Duty performed as advertised and the quality is also great. Five star experience. Over all, best round out there. This is the best ammo you can buy. Works flawlessly and causes major damage, as seen when shot through ballistic gel. Absolutely the only round I would use when carrying. Great buy. Great ammo. We also have this 40 S&W - 175 Grain FlexLock JHP - Hornady Critical Duty - 200 Rounds ammo in stock in a bigger quantity.